Today marks two months after the Jan. 12 earthquake. Hundreds of thousands are still homeless and camping out on the streets of the capitol. Andre is spending his fourth night in a tent in Port-au-Prince and is growing weary already. He's been great about staying in touch via iPhone, emailing lots of photos: of the land we wanted to buy, the cracks in his family's house in Port-au-Prince, and family members with their tents. I'm joining him next Wednesday morning after 26-hours of travel and two stopovers. We have reservations to return April 7, but Andre doesn't know how we can stay that long. When he went downtown he saw a man bleeding to death in the street from a bullet wound. I don't know if I'm ready for this. Today was a productive day for me. I bought a solar backpack off craigslist, which will supposedly recharge cell phones and iPods. Because of lack of electricity it's been challenging for Andre to keep the iPhone charged; he even had to pay one time for recharging service. The city sometimes turns on the electricity in the houses, but you never know when or for how long, which is how it always was, even before the quake. A friend who went to the same high school with me in Chula Vista, back in the 1970s, surprised with a generous cash donation, plus two suitcases, one filled with toiletries, first aid kit, tiny sleeping bags, and mosquito netting. I spent half of her donation on assorted flashlights: mini-Mag lights, wind-up flashlights, key chain mini-lights, and rechargeable batteries and charger. The Haitians always need flashlights in Port-au-Prince, even before the quake, because they rarely have electricity. Whenever we visited, they let us use the kerosene lamp. I could read for a while, but not too long because the light is so dim. Soon I'd just give up and go to sleep. You can't do anything in the dark and you can't leave the house because the whole neighborhood is pitch black. Only some hotels and businesses used to be powered by noisy gasoline generators. This was before the quake. I don't think there are any hotels and only few businesses left. I spent a lot of time today on the internet, connecting with a carpenter/EMT who has enough frequent flyer miles for a round-trip ticket. He said he'd love to go work with Andre's stepfather, depending on what happens with his business. I also hooked up with John Calvert, an expert on perma-culture. He suggested a variety of ways to get water to the land...assuming we could buy the land. It seems all that's changed. Andre and his stepfather had a meeting with the owner of the land in Athis that they wanted to buy. Now he's changed his mind and doesn't want to sell. I don't understand why he would string Andre's stepfather along for a month if he didn't want to sell. Mathieu must have gone back and forth between the capitol and the mountains at least a dozen or 20 times while investigating this deal. I could hear the frustration and discouragement in Andre's voice when he told me the news. 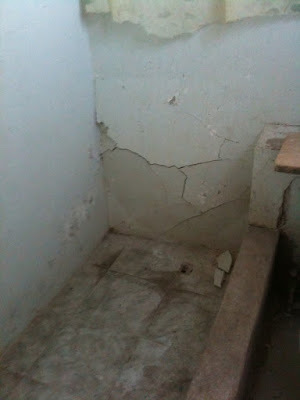 But there's good news too: damage to the Port-au-Prince house doesn't look that bad, at least not from the photos Andre sent me. 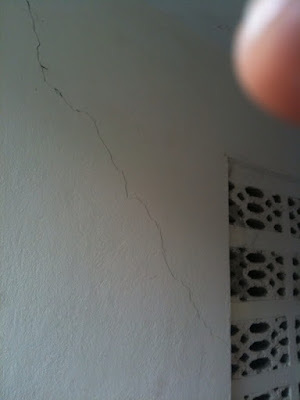 I'm not an engineer and I'm not seeing it in person, but as a Californian, I'm used to cracked buildings. Often it's just cosmetic damage. Even after the 6.9 earthquake in Santa Cruz many buildings were saved by retrofit seismic repairs. 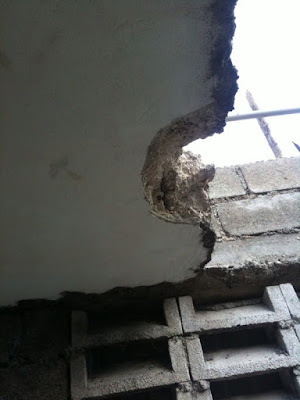 In a way, it makes more sense to repair the house in Port-au-Prince first. The land and building project can't finished before the rains, and tent living will get old fast. I love camping, but when it starts raining hard, I'm ready to pack it in and look for a hotel. Andre's family's house is about 1000 square feet on the main floor, has two smaller apartments in the basement, and a new two-room apartment for his sister, her husband and their kids on the third floor. So there's plenty of space for extended family members to squeeze in. I'm also a little relieved that the land deal is on hold because I've worried that Andre's siblings wouldn't be happy in such a remote, rural location. His parents, aunts and uncles, and grandma all grew up in the mountains, but not the siblings and cousins. Andre is the only one of his generation who did because he spent his childhood with his grandparents. He knows the country life and enjoys it. As an American, I like the mountain village also because it's cooler, cleaner, healthier and has a nice view. But it seems the initial panic to get out of the capitol is fading now that the aftershocks are dying down and the rains are coming soon. It happened here in Santa Cruz as well in 1989. They evacuated our neighborhood because the Victorian house next door to my grandma's house fell on her gas line. I was in Italy at the time, but my housemates and my grandma were instructed to camp out on the Santa Cruz High School football field, as aftershocks rattled their nerves. On the third night it started to rain, so everyone went back into their houses. I'm guessing the Haitians will do the same. One of the 14' dome tents that Andre brought was for a friend's family. They are extremely grateful for their new home. But in the camping area that Andre's family shares with about 70 families, there's nowhere to set up such a big dome tent, and I'm bringing another one soon. Andre's family is sleeping in a borrowed tent, which may be reclaimed if Andre's sister and her in-laws return to the capitol. Even though many of his relatives are sleeping under tarps, Andre is afraid to let anyone borrow the dome because they might not want to give it back when we need it. I was hoping we could use them on the land while we're building, but since that might not be happening, and since his family might be able to repair and move back into their house, I'm not sure what we'll do with the dome tents. They cost $350 for the tent, $50 shipping from Georgia, $50 for the floor tarps, and $100 for excess baggage charge -- that's $550 times three -- so I don't want to just give them away. Everyone wants one, but who can afford to buy them? Well, it's always good to be flexible and open minded. There's definitely no script for a disaster like the Haitian earthquake. We're two months into this thing and the end is nowhere in sight.